Whoops… thought I had posted this last week. eeeps. Willie had smoke coming out of his ears last Thursday night; I felt so sorry for him. I was giving a book talk at the west side Madison Border’s and brought Willie along to illustrate some of the tricks that Karen and I write about in Play Together, Stay Together. He had little trouble with the ones he knows well, but got hung up on transferring a cue from one hand to the other. I have been teaching him to do a ‘high five’ when I hold my hand up vertically, finger tips pointing upward, and to touch his nose to my hand when it is held horizontally, fingers pointing sideways. That’s not a trivial distinction to get, it took him a few days to get it when presented the cue with my right hand. The day before the talk I had asked him to make the same distinction when I signaled with my left hand, knowing that it wouldn’t necessarily transfer. It hadn’t, at first it was like starting over, but within two sessions Willie was responding correctly to both cues, given by either hands. However, I’d never tried it out of the house, and Will had only done it right a few times. I warned the crowd at Borders (thanks for coming, it was great fun!) that this was new for Willie… both a new trick and a new context, and sure enough, Will performed perfectly on the right hand, and then fell apart on the left. First he touched when he should have lifted his paw, then vice versa. Soon he began doing both at the same time (so smart). I quickly went back to the hand he’d known so well, but even that threw him. Soon he couldn’t get anything right, and I felt sure that he was mentally panicking. I swear there could have been smoke coming out of his ears. But hey, last night a Great Horned Owl called my way to the barn after the dogs and I followed our deer’s hoof prints up the hill. The coyotes have been yip-howling like some crazed rock band for weeks now, while the snow shines a blue-tinged glow over everything, and even on a cloudy night you can see without a flashlight. It’s spare and quiet and slices everything to the bone. And as much as I’d love a balmy beach right now, I still love it. Most of the time. Here’s a photo I didn’t mean to take–I just hit the wrong button at the wrong time. 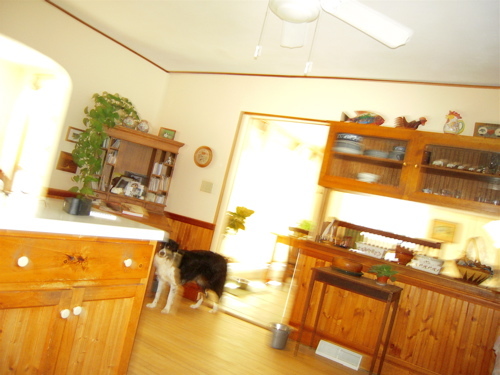 It makes me laugh for some reason, so here it is–Willie and the kitchen (your computer is fine, the photo is totally out of focus). « Paw Injury Makes Typing Difficult! Metallic sock liners… sounds intriguing! I laughed at the bit about telling your clients you’re sorry when they have a smart dog… Just today, I was filling out an application/evaluation for agility classes at my training club. One question asks about the dog’s strengths, and I wrote that she’s smart. The next question asks about her weaknesses, and I wrote that she’s smart. Honestly, sometimes I think she’s smarter than I am! If I don’t have a VERY clear picture about not only what the end behavior will be, the steps we’ll take to get there, and the different behaviors she might offer (and how I’ll respond to THOSE)… well, she’s learned things that I didn’t mean to teach! I have one of the really smart dogs and sometimes it can be a problem for me. When we are working on a new behavior he gets really into the training. If he doesn’t understand what is being asked of him, in what is an acceptable length of time to him, smoke starts coming out of his ears too. When that happens we stop the training after I ask him to perform a few things he solidly knows so he can quit on a success. The problem comes when I am through with the session and he is not. He continues to offer behaviors, I presume, to see if maybe he can finally get it right so he might relax. Often if he has time between training sessions to think things over he will just ‘get it’ the next time and is very proud of himself. The problem lies when he won’t let it go til next time and continues and continues to try. It ends up frustrating both of us-me because I’m not sure what to do, and him because he doesn’t figure out what he thinks he is ‘supposed’ to do. I hope your finger is doing better. A friend of mine did this recently and it was kind of gory. When I work with my hound mix we do encounter those “what do you want from me” moments. I attribute them to my still raw and developing training skills and her hound stubbornness. I usually back off and have gotten better at recognizing when she is no longer into “working with me” and has zoned my out. At that point it is best to see if I can get a simple sit and call it quits. We do APDT Rally and when this happens in the ring the judges we have shown under are really cool about letting you finish the course using any amount of praise and rewards so that you and the dog leave the ring on a positive note. Yes, you get the NQ (which you already may have gotten by having to ask your dog to “sit” 4 times), but at least my dog seems to know that the Rally ring is a fun, happy place to be. It is still quite cold where I am, but the sun was shining brightly today and I swear it made it feel at least 10 degrees warmer and let us extend our walk a little bit longer than usual. How are the lambs doing, especially the little black one. He reminds me of my first dog, the only black puppy in a litter of collies (can we say oops 🙂 ), my mom was a bit disappointed that I didn’t pick one of the collies (she always had collies growing up). My newly partnered service dog behaves similarly to your Willie when she gets confused. The hardest part is when this happens in public and getting welling meaning people to stop adding stress to the situation, while I work my dog through things she can be successful at. People seem to think this approach is mean in some way. It’s interesting that you should decide to write about those two tricks, Trisha. My Lab, Casey, knows both of them and it sounds like we use the same hand signs. I took a different approach to teaching them, though. I taught target right/target left as paired cues at the same time and then taught high five/other five several months later. Casey doesn’t have any trouble with the right-left distinction but I’ve noticed that when she’s highly aroused or excited she will still sometimes confuse the palm sideways of target with the palm outward of high five or even the palm down that we use for stay. As an ASL (American Sign Language) user, I find hand orientation very easy to perceive. It’s always surprised me that Casey has so much trouble with it especially when she responds without any problem at all to what seem to me to be much more subtle cues. It’s always a great feeling when I teach Casey a new trick and she gets it right quickly but I find it much more interesting to watch the errors she makes because I learn something about how she’s thinking from them. I think when I’m watching another signer I look first at hand shape, then orientation and finally movement but the various errors I’ve seen Casey make suggest to me that for her the most salient feature is movement, then hand shape and finally orientation far, far behind the other two. Here’s a quick experiment for you: Choose a trick Will and Lassie already know very well, something like sit or down maybe. Then cue it with your non-dominant hand and see if they are able to generalize and respond correctly. I used to be owned by a black standard poodle who I competed in obedience. He was such a clown and always managed to make me look like a ……….let’s say…….lesser intelligent person. He would be PERFECT at practice and ALMOST PERFECT in competition. He was very creative, my Giaco. (I loved that dog !) The judge called for an “about turn”. I did a perfect one, whilst my canine team mate marched straight to the end of the ring to admire a flag that was hanging on the wall. Now the judge commanded for a halt – and without my dog at my side – I halted. In the meantime, my canine companion had finished the admiration of the flag and decided to continue the test with me. He lined up perfectly and gave me the ever-so-wonderful look of admiration……………on the right side, instead of the left !!! Enjoy your dogs ! They have a better sense of humor than most people. I just finnished reading your book “For the love of a dog” and will continue with the ” Tales of two species”. I have two beaucerones from working lines, Comete and Breizh, great dogs but they are really a handfull or should I say a pawfull? I have a question for all of you. I have 2 dogs. A 13 year old toy poodle with pulmonary fibrosis and an 11 year old Yorkie. The poodle has top dog status in our pack, followed by the yorkie. I believe the yorkie “senses” the weakened condition of the poopdle. The Yorkie attacks the poodle and we have to pull him off the poodle. These attacks are unprevoked and vicious. The yorkie has always loved and obeyed the poodle. We, now have to have them living separate lives (one is out and running free in the house, the other is kenneled – they take turns with confinement). I have been told that the yorkie will not stop until the poodle is dead. Is this true? Is there anything I can do to retrain the yorkie to stop this behavior? Any suggestions will be helpful. Can tail wagging be controlled? Happy Tail has caused many an injury to the dog’s tail and once injured the tail takes a long time to heal. I am noticing that most owners under the advice of vets amputate the tail as the resolve. Can anyone provide directions/instructions on how to modify the excitement level, keep the same joy in th edog, but reduce the intensity of the tailwag?